In 2007 i decided to emigrate to Brazil. But i was (and i still am) company owner for 50% of the company Connecting Media and also was responsible for all crossmedia productions we do with this company. Because i became 12000 km parted from my my home office in Hilversum, The Netherlands. We had to solve some things to maintain our service, and even make it better. Being far from my home country, i missed my colleagues and friends and the way i worked, it made me invent and search for solutions to be as close as possible. I write this series of articles so that others can maybe pickup some ideas if they come in front of a similar situation. Because of my move to Brazil we have to change the company, we also had to change how we worked ourselves. And that was just the part of the projects in The Netherlands. To work in Brazil and also extend our business in South America was another thing that was on our list now. We called it an opportunity in stead of a problem. To do business you need clients and deliverers. So how we going to arrange that? In first we started to write to some delivers…… in the english language because we did not know how to do that in Portuguese. The communication was about a real job, renting 10 XDcam professional video players for the Formula 1 at Interlagos São Paulo. I wrote to more than 10 companies that could have this equipment for rent. After some weeks i got 2 replies from the 10 i did send. The reply was in Portuguese and the message was that they did not have this equipment for rent. Meanwhile a third deliverer who i knew already very well, went behind my back directly to my client and delivered them the video equipment. Meanwhile i got some jobs by family and friends, small jobs but nice to learn about doing business in Brazil. To network we became a member of Dutcham, The Dutch chamber of commerce in São Paulo. We thought we could extend our Brazilian network by them, but also the Dutch network in being a member, in the end this did not bring what we needed because it feels for me their focus is just on big companies like KLM, Philips, Heineken and Unilever and not small ones like ours. I learned that a lot of Dutch companies who are doing business in Brazil and even had offices or factories in Brazil by LinkedIn. We made some very nice contacts here and even a first interactive webcast job by a student at that time on the FGV university in São Paulo. Because of this job we were mentioned by another dutch company who produces the worldwide events Sencity. For them we did a nice live streaming production between Rotterdam and São Paulo in 201 from the MAM. Next we started to visit some exhibitions about our line of business. At the AES Brasil we met mr. Danny Littwin with his company New York Digital. A New Yorker, but now living in Brazil and like me an Audio-engineer and also married with a Brazilian woman. By Danny we got to work at the UFC events in Brazil. Because of our Dutch partner Multi-Link Holland we work since 2011 every year at the Formula 1 at Interlagos São Paulo, assisting with the main international TV feeds for EBU. By having contact with the Dutch consulate in São Paulo we produced an Interactive webcast for them, Urban Mobility. So, now we have some regular jobs in Brazil….. but just one of them was done for a Brazilian company. All the other jobs were for foreign companies. And to make the story short… this hardly changed in past 7 years overhere. We mostly work for foreign companies, why? We think it is all about communication and culture. the Brazilian culture is totally different than from the American and European culture, and also in doing business. A lot of business between companies and people here is done by family or friends from the family or friends from friends etc etc. It is of course possible as non friend or family member to do business here but it is not easy. It is also true that Brazilians think that we are more expansive, because we are foreigners… that does not really help in getting jobs. My findings is that if your are following a lead, and you have had 3 times a lunch with them to talk about doing business with that company, it means… we are not going to do business.For Brazilians it is not polite to say no, so they never will tell you this. That is why we never received any communication anymore after we send a proposal, because when you loose the bid, they will not tell you this….. it is not polite. Another thing was arranging meetings. I am Dutch, so when i do a meeting i communicate this far (weeks) in front if possible. On the day it self i appear in time, that means at least 15 minutes before the meeting happens. The first time i appeared at a meeting, 15 minutes before the actual meeting that we agreed 3 weeks before, the lead was surprised i was there. Because it is normal after you make an appointment 3 weeks before, to check a day before if the meeting still will go on. In this case, they never expected me, because i did not call them the day before. We decided by all our findings and experiences with Brazilian Leads that our aim would be foreign companies at first. This will give us a head start already because of communication… in English, German or Dutch. One thing that you can use in getting a deal is that Brazilians often think that products or productions from foreigners means also more quality…. it also means again we are more expansive. My experience is that some choose for quality… and choose the foreigner. Our problem was also local network. Brazil is HUGE! We needed a tool to acces more contacts. We created ourselves an online marketing tool. And it was called BroadcastBrazil.com. What is this BroadcastBrazil.com? You will read on the website that it is all about broadcast and in the english language. By this website we get network contacts, leads and clients. How? Ok here it comes. We aim here for Brazilian Audio visuals and we push them a little to start to read in english about the things they like… their job. They can become a member so they will be put with their profession and contact information on the website and social channels, good for them! But also for us, because we started to know about those english speaking Brazilian audio visuals. Besides that we started to connect with them by linkedIN. This all worked out pretty nice. We get big and small leads by this website, the website even delivered jobs for foreign broadcasters for some members and we get more contacts with Local and foreign Broadcast companies and people. We have nowadays nice local partners in Brazil like Roeland van der Manden (he is dutch) from Amsterdam productions in Rio de Janeiro and Shane Glen (he is Australian) from Soulpics Photography in Socorro. And we got some new international clients from USA who do business in Brazil. And even some local companies. The Tool BroadcastBrazil.com works… and we have some more nice plans for it in the near future. We learned to do business in Brazil by hitting our nose against the wall several times overhere… pretty hard. The so called Brazilian ‘partners’ never worked out for us and even cost us time and a lot of money. For others it might can work out. Our marketing tool BroadcastBrazil.com combined with our local partners, regular network meetings and visiting events connected to our type of business did show a rise in our local Brazilian productions. It helped to translate our website in Portuguese… and also doing our socials posts on facebook, Twitter and LinkedIN in the portuguese language. Most important is to read, write and speak basic Portuguese because almost nobody here can do that in english, it is the most tough part of all. Ah… and never give up! Overall i like to do business here in Brazil, learning this Brazilian way and also innovate our methods in getting new local clients. The knowledge we got helped us further. You must be patience to get the result you want. Next time i will talk about some productions we did in Brazil and their difficulties we just can have in Brazil and how we solved them. Dutch consulate in São Paulo, Urban Mobility. I write the following because i feel i have to… These Dutch Alien in Brazil series are all my personal experiences and feelings of my life in Brazil. Let’s talk about TV…. television and a little Radio. In Netherlands we watch a lot of television, this is not different from Brazil. When i arrived first here some years ago i started to discover the Brazilian Channels, TV Globo, Band, SBT, Rede TV and TV Cultura + some local channels in Santos. And i discovered… it is different…. very different than i was used too. As you may know i work professionally for TV so i shall not talk these differences, just the programs. TV Globo starts the day with Ana Maria Braga’s breakfast show followed with some talkshows and than it is filled with so called Novela’s.. Soaps, and even a program about it (videoshow). The other channels try to keep up with also programming Novela’s. Or Crime programs like Brasil Urgente with a criminal looking presenter who talks and talks and talks about the live feeds from helicopters who are hanging above a crime scenes for at least 2 hours. At night we have a hardcopy of the American type of Talkshows with an old Brazilian presenter named Jô , mostly having TV Globo’s famous people as guests… very very interesting! Than on sunday it becomes better on TV Globo with… Faustão. A very… special … looking presenter who has about 40 beautiful girls dancing between the program subjects and smiling at the right moment… and it is all heavily sponsored by for example a Ham producer. Faustão weares ridiculous shirts and huge watches around his arm. I followed the program some time but i became bored within some months. At sunday night we have Fantástico, that program has sometimes some nice subjects as also Globo repórter has…… sometimes. But i cannot get used to all those talk programs where they… talk. It is for me totally not interesting at all. Same kind of programs on the other channels btw! The best Brazilian TV channel is by my opinion TV Cultura, my little 2 year old daughter can watch there non sponsored children programs in which is great. They bought a lot of international shows like Shaun the Sheep and Bubble Guppies. But they also have some Brazilian made programs for children like Quintal da Cultura and Que Monstro te Mordeu in which are very nice programs. They also show good docu’s, music programs and other culture stuff. I consider this channel as the BBC from Brazil. And we have Canal OFF from TV Globo, not bad at all also. But… i missed of course after some time my ‘own’ programs. I like to watch sports , in europe we the great channel Eurosport, in Brazil we have sporTV and ESPN. In Brazil we can watch great soccer games, Volleyball, Basketball and beach sports…. a lot. I wanted to watch my autosport evens like Blancpain GT, DTM, WTCC and the english BTCC races, but also the classic bicycle races and ice speed skating. Most of this is not transmitted by any Brazilian channel, even not commercial ones like SporTV or ESPN. Ofcourse i can watch races like Stockcar and Brazilian Porsche Cup, but it lacks the quality as TV program compared to Europe, i did not get connected with these autosport events. But dutch people who live in Brazil also like to watch “Boer zoekt vrouw” , “Wie is de Mol?” , “De wereld draait door” , “Flikken”. Or just watch the NOS Journaal. Let’s talk about the solutions i found past years. With a dish and receiver you can receive the BVN satellite transmissions. I did not have the option to setup a satellite dish because my veranda was on the wrong side of the building where i lived. I could not reach any satellite from there. But check the solutions from Elbenk COM. They have very nice solutions for Satellite and IPTV in Brazil. I had to search for other options. VPN solutions are a good solution to go around a so called Geoblock, but it also kills your available bandwidth. A geoblock is a block on IP adresses based on countries and areas. The server you visit checks you IP address and will block acces if your do not have a dutch IP address. Service like Hola, Cyberghost, Tunelbear and HotspotShield can trick the service so they think you are in The Netherlands. There are some doubts nowadays about Hola, check this link. But it is not the only solution i thought, it must be more easy….. by internet streams without VPN. Formula1 is transmitted live for free on TVGlobo, but i really dislike the Brazilian presenter screaming thru the team radio messages, besides that he is in love with himself. Other european autosport and bicycle races are not transmitted by any channel here. After some searching i could find livestreams of those events on several websites. Ustream, Streamhunter and the Russian Live TV website makes them al available. So now you can watch also Paris->Roubaix, Tour de France and all Winter sports live. And even watch the 24hours Le mans on Eurosport for… 24 hours…. great! The app and website ‘NPO Uitzending gemist’ works great in Brazil if you have an internet connection from10 MBit or faster. On the latest AppleTV you can also install the ‘uitzending gemist’ AppleTV App. RTLXL gemist has a lot of blocked content and the streams stop a lot. Both services deliver on-demand programs you liked to watch back in The Netherlands. 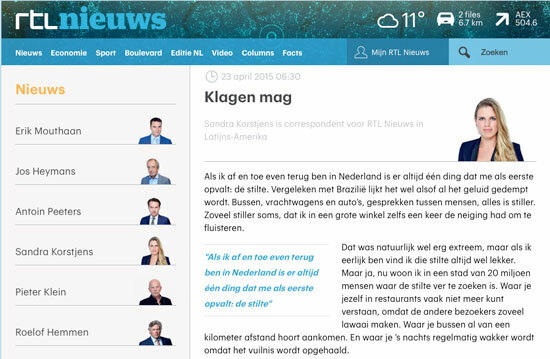 BVN has a livestream up as a test with Dutch and Belgian TV programs. I use NetFlix in Brazil on an Apple TV, also a lot of other channels on the AppleTV work great in Brazil like the RedBull channel, CNN, Sky-News and Yahoo. Than we have YouTube where more and more events are transmitted live for free. Other services like couchtuner and sopcast also work very well in Brazil. Invest in a good internet connection to watch good quality HD streams. If you have problems just shut down all tabs of your browser. This wil safe bandwidth. If you use an Apple TV or Google Chromecast stick just shut down all other devices. Than all bandwidth will be available for those streaming solutions and you can watch in HD quality. In some browser ‘players’ you can choose also the bandwidth of the livestream itself. ISU and YouTube have these options for example. Than there are more and more apps to watch on-demand and live TV from all over the world. I will add those in the app list underneath this blog entry and it will be regular updated with new apps for all devices. What you miss you must arrange. Now i can watch Dutch and other European TV programs that i liked…… in Brazil, this is for me important to survive :) Besides TV i also listen often to dutch radio stations. I found a nice App called TuneIN. With the App you can add your own favourite channels like Radio1, 2 and 3.. Radio Veronica or 538, but i also added the great Rio MPB :) The culture difference between The Netherlands and Brazil is also on TV, I choose to watch what i like from both countries, be able watch a subject on Fántstico and follow the ice speed skating, listening to Radio veronica and Rio MPB is just great. Thanks Leendert Bentschap Knook en Marc Vissers who gave me some tips about deliverers and services i did not know. If You have anything to add for this article, just reply underneath at the commentt area. In 2007 i decided to emigrate to Brazil. But i was (and i still am) company owner for 50% of the company Connecting Media and also was responsible for all crossmedia productions we do with this company. Because i became 12000 km parted from my my home office in Baarn, The Netherlands. We had to solve some things to maintain our service, and even make it better. Being far from my home country, i missed my colleagues and friends and the way i worked, it made me invent and search for solutions to be as close as possible. I write this series of articles so that others can maybe pickup some ideas if they come in front of a same situation. Because of my move to Brazil we have to change the company, we also had to change how we worked ourselves. And that was just the part of the projects in The Netherlands. To work in Brazil and also extend our business in South America was another thing that was on our list now. We called it an opportunity in stead of a problem. First thing that we need is a good communication between our offices and so a stable internet connection became very important. In Brazil for me it was going back in time if you talk about internet stability and speed. But hey, i am here so i have to cope with it. I was situated at that time in Santos and over the years i upgraded the broadband from 0,5 til 30 Mbit download… upload stayed always slow, just 1 Mbit. At the moment i did the first upgrade in 2008 to 4 Mbit it became possible for me to work remotely on computers at my office in The Netherlands. We used programs like Remote Desktop from MicroSoft and Remote Desktop from Apple. For these options and also VNC you need to do some action called “port forwarding” in your internet router. A more simple way can be by programs like Splashtop or Teamviewer. We have good experiences with all these programs and online solutions. From that moment on i could do all administration tasks, like bookkeeping, invoicing and more by logging in from Brazil on our computer in The Netherlands and work on it like i was there. One day a co-worker watched me working from Brazil on the Blue Apple G3 we used for our administration in the Netherlands, making some invoices. he watched the mouse-arrow moving by itself. When i hit the button PRINT in Brazil, the printer in our Dutch office start to print all invoices. VOODOO , it’s VOODOO he screamed :) Another step that we did is the change to digital invoices. We started to send invoices to our clients by an email. Some of them did not like it at first, but most of them agreed. Past years i receive also almost all invoices from our deliverers by email, the rest is scanned at our Dutch office and is uploaded to our server so i can download those. At the moment 99% of all administration and communication in this is done in Brazil. But i also started remotely some webcasts productions in the Netherlands. Our webcast crew had to make it possible that i could acces the live encoder and start the webcast. Pretty handy when we had some jobs at the same time or when a webcast must start early in the morning or at night. Nowadays i even do video edits for clients outside Brazil in our edit suite in Socorro. We upload the footage to our server, i download it to Brazil, edit a great video from it and upload it for preview to the client. The clients love this… i will explain this later. Like i said before is communication important for us, we were early adapters from Skype. Of course is email our main source of communication, but sometimes you must talk with people. We added a landline number from Brazil to our Brazilian Skype account and suddenly the Brazilian office had phone number. Now i could Skype with our clients and deliverers… if they did not use Skype i could call them by phone… and it was cheap. It worked just great for us. Nowadays we use besides Skype also FaceTime, WhatsApp, Facebook chat and Twitter to communicate with our clients and deliverers. For additional communication we sync our agenda’s, first we did this by our own server but nowadays you can achieve this easily by a cloud solution. In this way the both directors but also co-workers can look in each others agenda. In the beginning of 2015 we also started to use Slack to keep track on all our on going productions, by Slack we know about the status of a project. Everybody in our company can add projects and change the status of a project they working on. Besides a desktop version Slack also has apps for Smartphones. For following Leads projects we use another online service called Clinchpad, also here we all can add and change things. All apps that i use on my iPhone to communicate i will explain in another blog post later in this series. Our clients love the time difference, often we record on location in the Netherlands in the morning, after the dutch film crew uploaded the footage i download it. In my ‘quiet afternoon’ i start to do the video-edit in which i upload for the client to view. Because of the difference in time our office is longer “Open”… so when the client opens it’s mail in the morning they find the first video edit preview already there… all within 24 hours after we recorded it.. all because of time difference. And without any extra costs for the client! As you can read is communication the main thing when it is about running a company in one country while you live in another country. A good and stable internet connection is a must, broadband at the office and 3G/4G on your phone when you are on the road and as backup. But one thing is more important than all i mentioned before is a great partner in which you can trust fully. Because it is all not easy, with a lot of problems to solve. In my case this is the dutch director of Connecting Media Netherlands and co-owner of Connecting Media worldwide Michiel Overeem… thanks mate! Change yourself …. To turn things in your profit. Next time i will talk about networking in Brazil. Learning a lot past 6 months with my growing up daughter, my new city Socorro and being very busy with my company Connecting Media, so not too much time for my Blog. But here a short entry because of something funny that happened last week. I learned in practice that Brazilians do not like to be criticized about their country Brazil by foreigners, they are very sensible for that. Even when this foreigners are not ment to criticise , a lot of Brazilians will take it that way. 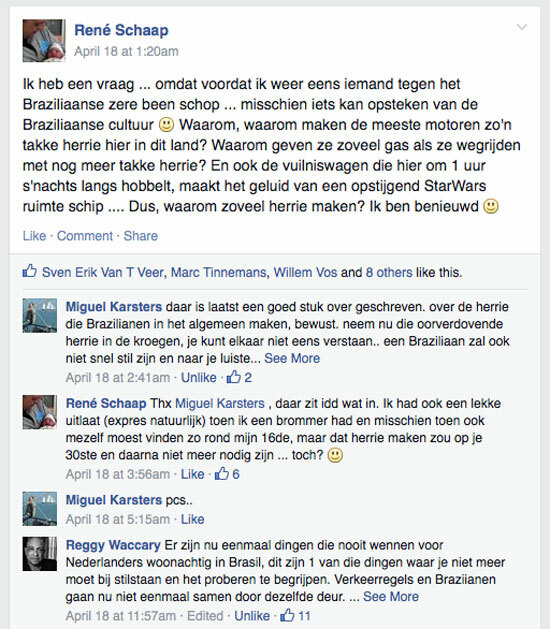 So… i transferred my so called criticism into a 'question' … i did not criticise.. i asked a question on a Facebook page for Dutch people in Brazil. My question was why some Brazilians make so much unnessacerry amount of sound. You know, i just want to learn about habits, culture and such to understand my surrounding better. And… what happened … some Brazilians in that group were 'upset' about my question. My question and the reaction were also caught attention by Sandra Kortjens, a dutch journalist for Latin America and she wrote an article about what happened. It is in dutch but feel free to copy/past the link it to GoogleTranslate. They do not complain …. They talk about what they miss. Next time when you read or here a foreigner complain… think just that he/she misses sometimes things and people that they were used to have or be with before because …. As i am living in Brazil, getting my professional cables and equipment is not as easy when i lived in The Netherlands. Buying professional equipment, cables and plugs is also much more expansive because it is all import, and that means that you have to pay at least 60% tax on it. My father teached me one 1 one import thing, he said "René .. you must pay tax …. but not too much", it's a life lesson i will never forget :) To get my stuffs i have to be smart and patient. One of the deliverers where i order a lot is Deal Extreme from China. If i keep my order below 25 euros and asked if they ship it in an envelope without logos, the Brazilian customs are not checking it. This works for plugs, cables, GoPro addons and a lot of gadgets. Even LED lightbulbs i buy there.. much cheaper than when i buy a lamp in Brazil. In 99% of all my shippings i receive them after 1 month, 1,5 month by the local post service. But sometimes it goes wrong. At the Deal Extreme website you can communicate with them about a shipping you did not receive. Communication is fast, the next day i got an answer from… Lemon. Yes his or her name was Lemon. Lemon told me it sometimes happens and asked me to wait some weeks, so i did. After 4 weeks i contacted my new friend Lemon again, he/she gave me the same instructions again. Lemon asked me to wait some more weeks, customs need their time sometimes. Lemon know the way it seams. After 6 more weeks i contacted Lemon. Lemon told me to go to my local post office… because they, the post office, said to Lemon it was delivered at my house, but as we know that did not happen. I went to the postoffice of Correios in Santos to get the proof that they delivered my shipping at my adress. the friendly mail-woman of the post office explained me that Correios never do this, she also do not know this Deal Extreme and this Lemon figure. I contacted my new friend Lemon again. But the Deal Extreme system told me that my ticket was closed, it was overdue? I must start a new one. Damn! But ok, i made another new friend. His or her name was Lucky .. i hope she is female because … ok i think it is clear. Lucky first ask me to wait some more weeks, hey i thought, that sounds like i start all over again. And indeed, in the 3rd communication she/he asked me to go to the PostOffice too. I did not went there again of course. I asked for a refund for Lucky because i waited for more than 4 months now without receiving a product. Than they started to be really difficult with me. Lucky asked me to wait more? I said 'for what?, i think this shipping is lost. I want my money back or send me the products again'. I also told Lucky i will write this situation down for my blog because people must know how they work. It did not help, Lucky tried to get me tired of it and giving up. UnLucky for Lucky, because that will not happen. I asked Lucky i want to speak the manager or boss because this brings us nowhere. Lucky said that she/he will talk to the manager first. A miracle happened, after 6 month my money would be transfered into a deal Extreme credit Lucky said after the talk with the manager.. than i can buy products from the website with that credit. For me that sounded reasonable and i agreed. "So if you want to buy other items on DX with the refund, then we suggest saving the refund as store credit, which is the fast and easiest way for compensation. and you can use the store credit immediately and directly to order the lost items again or for other items you like in next purchase. But if you choose to refund to your Paypal, then the refund will be complicated and very long since your order was made more than 3 months ago, direct refund is not possible. We need to contact PayPal to facilitate your refund. so it will take long"
Still a little bit weird, because PayPal is easy in this, but alright i was tired of Lucky … and Lemon too. When i arrived early 2006 for the second time in my life in Brazil i got the taste from Brazil we all (Gringo's) get in the first period. Friendly people, Great food, Sun, Amazing nature. I decided to stay... For ever... With my wife Adriana. That choice changed all of my life i had, but also me. All the changes i have to cope with and most of them are nice. My astma has disappeared because of better air it seams. I lost almost 20kg of weight while i eat and drink more here. So, Brazil is good for my health it seams. A very small pizzaria in Santos, Brazil managed to let me say this. I did eat pizza's all over the world… even at the source itselfs … Italy. Since i live in Brazil (since 3 years full time) i am amazed about the pizza's here. The quality is just outstanding good. My thoughts about this are that it is because of the local made cheese, the local grown tomatos and the sun combined with the knowledge they got from the italian immigrants. These italian immigrants has settled very well in Brazil in which shows of all the Italian restaurants, pizzaria's & pasta shops all over Brazil. The Italian food is very popular in this country. These european immigrants also invented something else here, something really special… it is a sausage called Linguiça Calabresa. The name Calabresa is taken from an area in Italy called Calabria. When i tasted that Calabresa-sausage for the first time i was amazed about the great taste of it. Of course i did eat other types of very good sausages in other parts of the world like from The Netherlands (Rook worst & Grillworst .. van Jan)… you can wake me up for those……….. and from Germany the Brätwurst. All very good sausages indeed… but no one can beat the Calabresa from Brazil. Everytime i order pizza, i asked for… Pizza Calabresa. After some months my wife Adriana asked me if i was not bored in asking every time the same pizza. I explained i did not have this Calabresa in the first 40 years of my life (in which i lived in the Netherlands), so i will eat it in the last 60 years for sure… i have to catch up :) But of course she convinced me one time to ask another type of pizza next time. I asked for a Pizza with cheese, tomato and garlic. And….. i liked it… but it did not beat the Pizza Calabresa. Than i thought, let's combine a Pizza Calebrasa with The Pizza Garlic. The 'Pizza René' was born. I mostly ordered this pizza at a little pizzaria near my house. 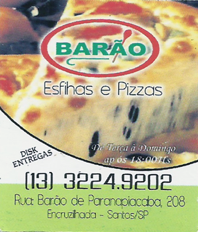 Pizza Barão. A very simple place, but this pizza chef knows how to make a very good pizza. The chef at Barão got the pizza balanced, we enjoyed it every time like a great experience. And not only the Calabresa Pizza, the vegetarian one for Adriana was also awesome. 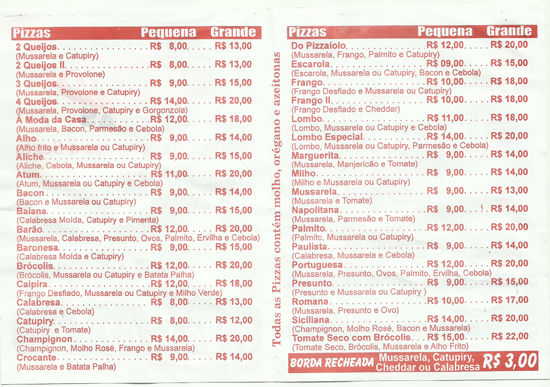 After some time we tried a pizza at some other places in Santos, like the famous van Gogh and Cantina Liliana…. both are very respected about their pizza's. 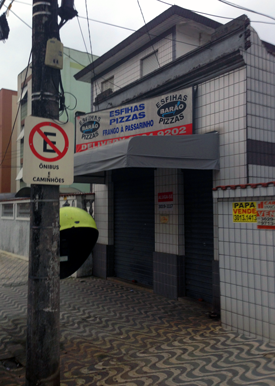 But both Adriana and i were every time convinced….. they were not beating this little pizzaria. The little restaurant also became a meeting place with some co-workers of my company Connecting Media in Santos. We all liked it very much! And this week i discovered it is all over. My little Pizzaria is no more. On their location was a little 'for rent' sign on the wall. No more pizza René. 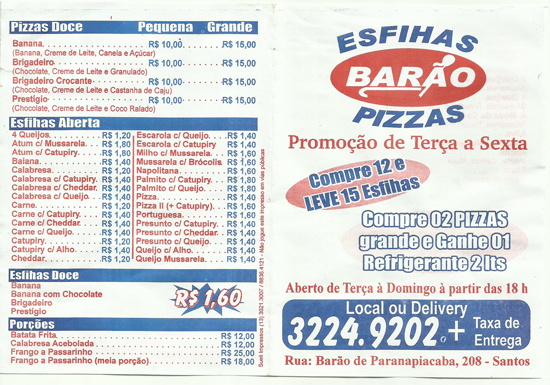 The name of this little pizzaria was Barão. located 100 meters from my apartment in Santos. It was very small and simple, but it was a place were some people worked very hard…. delivering quality food to their clients. One time i celebrated my birthday there, i will never forget it.. it was special…. they were special. I do not know why they closed down so sudden, because business was good. Adriana thinks it is because they did not have the right papers to run their own business, and they were closed down by the (new) local government because they did to have enough money to pay for this licence. I think this is sad. I know they have to have this license, but…….. I also think these micro companies deserve a chance, even when they do something wrong. Why? because the try to deliver quality to their clients…. and that is already very special and very unique in a world where it is about money and profit. Most of them forget to deliver quality for their clients! Barão Pizza is no more. I want to thank the people from Pizza Barão to give me this great remember of the best Pizza in the world! To keep the story up a pay some respect for those hard working people i will now rename the Pizza René into a Pizza Barão. When you order a pizza it in any Pizzaria in the world asked for the following: Pizza Calabrasa with Cheese, Onion and fright Garlic… Ask for a Pizza Barão. I feel people in Brazil do not understand me sometimes, or 'get me wrong'. I have had some experiences last few years with situations and with people in Brazil that led to things that i did not expect. Happily mostly positive ones but also some negative ones. April 2013. I have a CPF and a Brazilian ID card. "Classifição Permanente" it says. At the same time i found out that after almost 6 years i am still a kind of Alien in Brazil.………. Why? That i was asking myself. Because when i know.. i can solve it… yes? sim? ja? 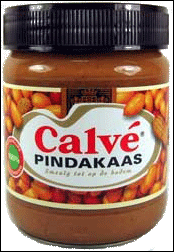 When i started to make that dutch food i found out that all food ingredients and spices have another name… good for learning the language better. Yes, and spend at least four times as much time for groceries than normal because you cannot find what you need …. or bring some Pimenta (Peppers) in stead of Pimentão (Paprika) back to home. Search 1,5 hour in the supermarket for Vanilla, and learn it is called Baunilha here .. hahaaa. This is not only happening when i buy food, it is with all i want to buy or ask…. my equipment and electronic parts i need for my company, things i try to buy to repair something in our house , even a present for my Adriana. All is different. You have also to find this new places , shops and malls where you can buy what you want. I have to explain myself to the salesperson in portuguese, and they have always a question back :) Sometimes it gives me some frustration, because i could not buy what i wanted , like yesterday i went myself to open a bank account… i did not manage because my portuguese is not good enough and the bank employee could not speak any english. I feel i have to depend on others for the most simple things and actions, in which i can do in a snap of my finger when i am in the Netherlands or any country where people speak english.. or dutch. I also knew nothing about Brazilian music, politics, history, art or the Brazil topographic. I feels to be set back in time and learn some of the local basics when you are about 6 years old. Some think here i am not smart because of that…of not knowing or understanding some basics. But i can say they just do not understand what it is to have your life what you knew for 40 years.. turned 180 degrees…. and need to learn some of these basics again. For me this is like i am breaking all the time when i drive on an uphill road on my bike… It is slow… it is hard, but it goes. Because i am still learning my 4th language it is for me still very difficult to communicate … every day…all the time… even with my own family. I cannot speak dutch here and have to speak in my secondary language english to communicate with my wife, my family, friends etc etc…. and that is not easy. To show your 'feelings' in another language is damn difficult. Besides the talking, also listening is part of communication…. i sometimes cannot catchup with the talks. With a room full of people it's like being deaf. Everybody is talking around me and i cannot react when i want and how i want… i am not fast enough to understand what's about, you cannot even laugh when somebody makes a joke. Besides that it is sometimes about specific brazilian things and subjects… in which i do not know mostly. Or i am just missing one or two words in a sentence and than losing all what's about. The songs they sing together in a party .. and i cannot sing with them together because i do not know these old and famous songs. Than you can feel very alone in that room full of people. You are not realy part of this group. Because of that i miss certain details to react to people in the right way…… people can understand my reaction totally wrong and than get a wrong idea about me, and because as being raised in The Netherlands… i also react different sometimes. But also the feeling and enjoyment is different than when i would have being able to have learned it all 40 years ago. Dutch and Brazilians are in some case… the same and opposite. But the language alone is not the solution. But …..why not! you think? , it helps a lot… of course. Because i will always be a kind of Alien here…. because of the way i have being brought up by my parents and grand parents, with the almost 40 years living and working in the Netherlands. That is something you cannot just delete in a person it is in my core as a human being. I am a dutch guy, living in Brazil. Accepting my changed world and try to cope with it. But still i will react in an other way that Brazilians do in some cases, or i do things in an other way than Brazilians would do… I think different about certain things. Walk on the beach when it is raining. Watch different things on TV, like Ice speed skating on a hot summer sunday or saying something 'direct' but honest to a person. I do not like that people promise me something, and than not keep their word. When you make a bet.. than finalise it. When you agree in a business partnership to respect each others clients… than do so. When i do a job for you… pay me! If you cannot manage our business meeting in time... inform me… call me. Does it make me a bad person or a strange person when i say something about that? ! … for me those are normal things, for others sometimes not. Do others have to ignore me because of this? I do not hope so, but it makes me an Alien Brazilian for sure. It is not possible for me… or any other foreigner btw to cope and understand all these specific Brazilian habits in just 6 years, and for Brazilians it will not be possible to understand my Dutch way that easy for example… it is just accepting eachother. I have a lot of new friends in Brazil who also come from other countries than Brazil, i know some of them have the same experiences as i have. I do not care Brazilians call me a Gringo here, i am one for them ……. but i do care that some ignore me because i am one… because i am different, think different, react different. The results for me: it is difficult to fit in, even when you get this warm welcome always. it is difficult here to build a new network with friends, business partners & clients like i had in my 'first' country. it is difficult to get a job ( i am expensive because i am a Gringo is the first thought in Brasil ) , as a company for me it is difficult to get into a project because of the different way in doing business ( i am learning ), it is difficult being ignored by some people or even being cheated behind my back for some money…. but also to find those new real friends.. to spend some time with… being personally invited as René , doing some gaming together… playing some pool… watch sports together or just having a beer and talk. I know for some of you this all sounds small, for me it became big. This all will take time… a lot of time. I know that. I must just have the patience to build my life here so i can be fully happy. The new adventure Schapie will help me a lot with that for sure, i am looking forward to it and concentrate in that… being a father. I will also not give up, and fight for what i am worth for to learn portuguese and understand Brazil and Brazilians better. What i hope for is that it also works in both directions and the people around me will still able to give me some patience, some space , support , time and respect for who i am…. because that will give me as a Dutch Alien in Brazil exactly what need to become a better Brazilian, better person and great father. I am not saying anybody must do this, it is your own choice. So… yes…. i can solve it. yes, i will not give up… i put my teeth in it. I will have to catchup in all that Brazilians know already all their life. I love Brazil and it's people, it's habits.. all of it. With the help and support of my Adriana, my family and support of some fellow Aliens here in Brazil i can. Some years ago a switched from my home country Netherlands for Brazil, following my heart. I landed in a nice city named Santos. Family and friends were of course sometimes surpriced about my move and also about the place where i started my new live. I got a lot of questions about my move, but also about this city Santos. the most of my family and friends did not know this city at all, while it is a pretty nice place and in history it was of some importance. Everybody knows Rio De Janeiro and São Paulo, other Brazil cities are not known most of the time. They also knew that i did like to live outside cities, farmer areas :) .... more quiet, so.. what's about this city? In this article i try to explain it, i just to show what kind of nice city it is, and how important it was thru the history and still is nowadays. Cidade de Santos is more than 450 years old. A 1 hour drive by car from the metropole São Paulo. Santos is situated 800 meters lower than São Paulo, it has almost half a million inhabitants and it can be only reached by 4 main roads like Anchieta, Imigrantes , by Praia Grande or by a ferry via the city Guarujá. Santos is in fact an island, it lies in a beautiful bay at the Atlantic Ocean with just outside the city the 'Mata Atlântica' type of nature. On the Guarujá site of Santos is the side where the port is located. Santos has the biggest port of South America. The port is used for im-export of goods, mostly by containers, other products like soya, orange-juice and the huge windmill-blades made in Sorocaba find their way to other countries by the Santos port. Besides goods also people transport takes place at the port site, from the cruise-terminal huge Cruiseships leave the port every day in summertime. The port provides the city it's dynamics and gives it also an international character. Ships from the USA, Europe and Asia go on and off, same counts also for the trains and trucks who are entering and leaving the city 24 hours round the clock. The port is the most important financial source for Santos and the state of São Paulo, it was that already hundreds of years ago when the coffee was shipped from the same port. For me it is a home coming because when i enter the city, the big tanks of the Dutch company VOPAK cannot be missed. Coffee... 'Café do Brasil' is how they call it here. Santos had an important influence at the time that oil was not the main subject of trading on the world market of economics. At that time the coffee price was the most important number for economics. The decision what the world coffee price would be was made in Santos at that time. Nowadays you can still smell and taste this history in the Coffee Museum located in the old centre of Santos, 'Centro Comercial'. Till today some coffee companies have their offices located around this coffee museum. The museum itselfs is just great, it shows the history in a very nice way and after your tour you can try the coffee yourself or even bring fresh burned Brazillian coffee to home. It is nice to walk around in this area of Santos where you can see old portuguese type of buildings. 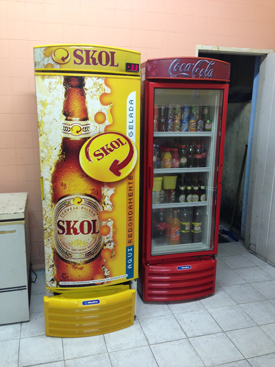 Try a very good 'pastel' with a nice 'chopp' on the corner near the main square at a bar called Café Carioca. There you can start to taste Brazil already. Beware that everything is closed after 20:00 hours or so, and on sunday the places mostly open after 13:00 hours. Santos has an old tram track thru the old historic centre, when you are here you 'have' to take a ride on one of the three different trams. The tourist guides will tell a lot about the history of Santos. They will show the port side, the old 'Centro Comercial' and the place where the slaves did hide run when they escape hundreds of years ago. You can go by a cabletrack train to the top of the mountain Monte Serrat where you find a very old building, formerly used as a casino. Gambling is illegal in Brazil so as a casino the building history, but it takes you back in time . On the same mountain you find also a little church but the best is the 360 degrees view over Santos, it is just astonishing. See also the video at the bottom at this article, because they race every year a downhill competition from this mountain. For years there are plans to make a Pelé museum, the last i heard about it was in 2010 with even Oscar Niemeyer involved. We will see :) But till today we have to do it with a tour you can get in the soccer stadium of Santos FC, there you can feel a great atmosphere of this impressive soccer club. At the moment their nowadays talents Neymar and Ganso are preparing for the worldcup in 2014... in which takes place in Brazil by winning championships for Santos every year. Than we have here a very nice beach, Lucky me :) Great for a walk or for a swim. The beach locations are easy to find, by the channels,numbered from 1 to 7. On this more than 10 km long beach you can find a lot of special places, like the surf school at channel 1.... the nice pier with the surf museum is also very nice to take a look. Near channel 2 you find a tiny cinema at the beach in which shows only rare and foreign movies .... there is even a library near channel 5. On the far end near channel 6 you find the sea aquarium (Aquario). Nearby this aquarium there is a place where you can rent a Kayak or Standup board for a very nice price. On the beach it selfs try a fruitdrink from Isa (near Channel 3), or a Pastel and Caipirinha at one of those little rolling shops on wheels. In the morning you can stay for the tambourel games in which are taken place all over the beach, this sport is even invented in Santos. In the late afternoon the beach is free for beachsoccer and beachvolleybal, mostly played by the locals. But with their build-in Brazilian 'special moves' you can for sure enjoy this competitions at the sideline. Next to the whole length of the beach you can find an impressive garden, it seams to be the longest garden of the world next to a beach... mentioned in the Guiness Book of Records. I walk here as often with my Adriana as i can. On saturday night you can find a nice market with handmade stuff and art at channel 4 inside that same garden. On this same market they also sell special snacks from all over Brazil. Santos is nearby São Paulo so every weekend with a little bit of sun brings a lot of the so called 'Paulista's' to 'our' beach. They bring also their dogs, surfboards, bikes, skateboards, longboards and inline skates. Santos has bike paths in which is pretty unique in Brazil, one track next to the beach garden and several tracks thru the city what makes it very safe to bike here. I am dutch, so i am biking all the time. it stays pretty impressive if you bike thru a hague of Palm Trees. But stay focused because the people are not used to bikes too much, i have crashed into some people already :) Extreme sports likes inline skating, skateboarding and longboarding is happening all over the park side , but the best spot is the pier where they made special tracks and ramps for them.